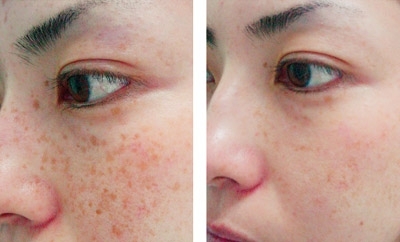 Most brown spots on the skin of the face or body are best treated by Fraxel Laser. Most often these are superficial age spots caused by the sun (sun spots). Classic examples are the brown spots on the face, neck or back of hands. After sun exposure, the skin fabricates a protective film that produces melanin pigment creating brown spots. Unfortunately, this pigment sometimes does not disappear. 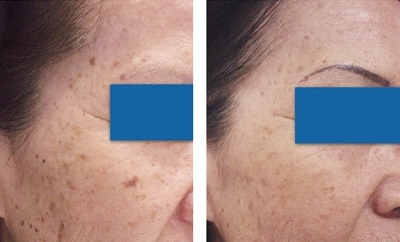 The Fraxel Laser Dual aims at destroying this melanin pigment without damaging surrounding tissue. Before the pigment disappears, it darkens for a few days as the pigment comes to the surface. The process takes 4 to 5 days. 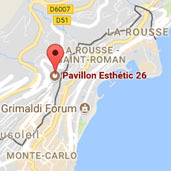 Compared to other treatments (such as abrasion, peeling, depigmentation creams and liquid nitrogen,). Laser treatment is the most efficient technique for age spots because surrounding tissue is preserved and there are less complications. Depending on the number of lesions to be treated, one or two sessions are generally required. No UV exposure (tanning booths, sun) 2 or 3 weeks before and during treatment period. No UV exposure for one month after the treatment. For best results, it is highly recommended to apply sunscreen for 2 to 3 months after treatment. Due to certain risk factors, we do not treat brown spots during pregnancy.